Description - Diamondtrax Tiles by are available in 14 popular colors and have been designed to withstand the harsh environment of any garage. These garage tiles have been formulated to be UV stable and are able to withstand most oils and solvents. 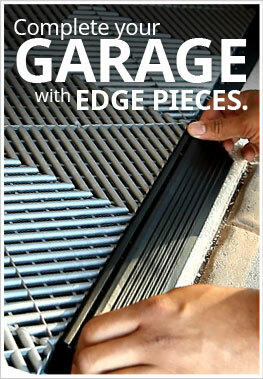 Our garage tiles are very easy to install and come in 15.75” x 15.75" tiles. These interlocking garage tiles are very strong, being able to withstand a psi of 5120, and are very slip resistant featuring a diamond plate pattern that will surely enhance the look of any garage. Diamondtrax tiles also feature an industry leading 15 year warranty. Note: These tiles can be damaged under the weight of a car jack. We recommend using your car jack directly on concrete. Weight – ~1.84 Lbs. per tile. Recommended Uses – Diamondtrax Tiles are truly built to be a multi-use durable floor tile. These tiles are most commonly used as garage tiles however they have also been used successfully as a flooring option in tool and storage sheds, as trade show flooring, in auto dealership show rooms to accent cars, and on auto and car show display floors. When installing the tiles, we recommend starting in the front left corner of the room and working your way out from there. Most Popular Garage Tile Style. Even those these tiles were a little more expensive than many of the the other tiles, I really liked the color selection that this product offered. I went with a checkered board pattern with a border around the floor with the blue, white and black. I am one satisfied customer. After 2.5-3 years of use the Garage tiles look just as good as new! The install was simple and we knocked it out during an evening after work. Just perfect. Easy to install, shipped quickly, looks great.